This article focuses on the influence of the latest economic crisis and theSyrian refugee crisis on EU politics, increasing differentiation among the EU member states in terms of their interests and policies. It discusses the move towards further differentiated integration in the EU and its influence onTurkey-EU relations. Firstly, it explains the influence of the economic crisis on European politics, particularly Germany’s rising influence, the widening gap between northern and southern Europe, and Brexit referendum in the UK which led to discussions on further differentiated integration within the EU. Secondly, the article explains flexible integration models that were put forward before the economic crisis and it discusses new options for further differentiated integration after the economic crisis, refugee crisis and Brexit referendum. 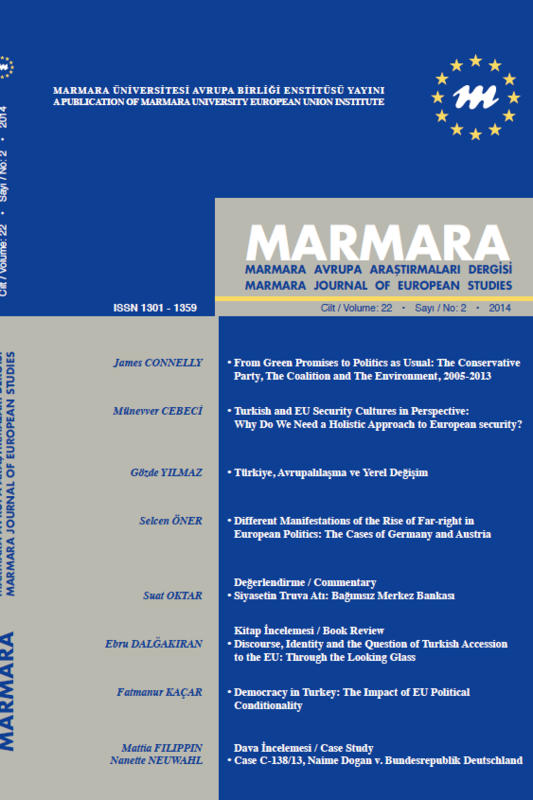 Lastly, the article evaluates the impact of refugee crisis on Turkey-EUrelations, the revitalization of Turkey-EU relations, the rising role of Turkey as a ‘strategic partner’ of the EU and discusses the recent challenges and prospects in Turkey-EU relations. Kölliker, A. (2001) “Bringing Together or Driving Apart the Union? Towards a Theory of Differentiated Integration”, West European Politics, 24 (4). Majone, G. (2012) “Rethinking European Integration after the Debt Crisis”, June 2012, London’s Global University The European Institute, Working Paper 3. Managing the Refugee Crisis: The Facility for Refugees in Turkey, The Commission Document, Brussels, 2016. ISNAD Öner, Selcen . "THE INFLUENCE OF THE ECONOMIC CRISIS AND REFUGEE CRISIS ON EU POLITICS: THE CHALLENGES AND PROSPECTS FOR TURKEY-EU RELATIONS". Marmara Üniversitesi Avrupa Topluluğu Enstitüsü Avrupa Araştırmaları Dergisi 24 / 2 (December 2016): 59-85.